Alfred Desroches was born in Pointe-aux-Trembles on March 29, 1839 and went to Assumption College. He left in 1853 to work for Bohle & Henderey & Leslie, goldsmiths, located on St-Pierre Street in Montreal. In 1863, he moved to Terrebone and he became a sergeant in the company of Volontaires de Terrebonne. In 1860, he married Julie Gervais and they had four children. 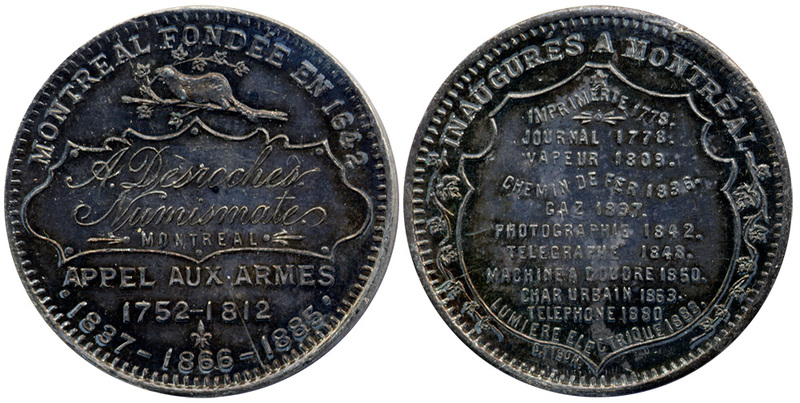 In 1881, he studied numismatics, wanting to know the history of his country and thus he began a collection. In 1891 he sold his collection to P.N. Breton and began another, which he sold in 1892 to the same buyer.